Hadassah s eyes widened, as she fought back the tears. Do you have in mind a name for me then? She loved this man dearly. Esther. Why Esther? Is it not obvious? I want you to shine above the whole lot. I want you to stay up where the stars are high above. Mordecai placed his hands on his young niece s shoulders. I must, however, warn you to remain humble and hold firmly to the God of our fathers. If this thing is the will of God, He will perfect it. His ways are above our understanding, for He does what seems pleasant in His eyes. A deep silence engulfed them as they walked on, then a warm assurance wrapped Hadassah in its embrace. Even as I bear the name Esther, I will always carry the name Hadassah in my heart, to keep the memory of my mother alive. If you keep quiet at a time like this, deliverance and relief for the Jews will arise from some other place, but you and your relatives will die. Who knows if perhaps you were made queen for just such a time as this? -Esther 4:14 The name Esther means star. Through the lens of history, she ll forever be revered as beautiful Queen Esther, the beloved female heroine of the Old Testament, whose courage and obedience saved the Jewish nation from annihilation. But before she was Queen Esther, she was just Hadassah, a lowly orphan girl, growing up against a backdrop of turbulent political times. In From an Orphan to a Queen, novelist Titi Horsfall laces historical and biblical events with fiction, weaving a tender and vivid recreation of Esther s journey. The biblical account of Esther is a story of deliverance and of prophecy fulfilled, through an amazing interplay of characters and divinely staged events. In this book, our heroine s story comes to life as a tale of hope and personal discovery a tale of a girl whose hopes and fears were not all that different from young women today. 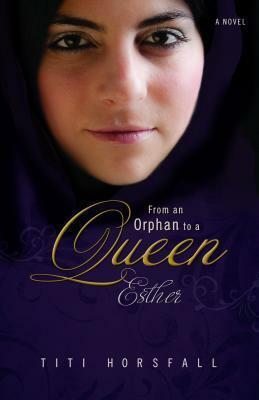 Chosen by the king, young Esther was forced to replace another wife, mother and queen. With the encouragement of her uncle Mordecai, Esther risked her life, revealing her identity as a Jew to influence the king to reverse an execution order against her people. Her brave actions forever changed the course of history. None of us get to choose the circumstances we are born into. Yet, as Esther s timeless and inspiring story reveals, God takes pleasure in fulfilling His purposes through ordinary people with willing hearts." Titi Horsfall is a public relations and communications specialist in the oil and gas industry. She holds a bachelor's degree in marketing, a masters in banking and finance, and an MBA in oil & gas management from the Robert Gorden University, Aberdeen. A collection of her poetry, Reflections, was published in 2004. Titi and her husband, Onamari, are blessed with three sons.